The odds of avoiding repeat imaging just improved. When patient prior imaging data exists outside of a healthcare provider’s enterprise, the clinician often resorts to ordering a duplicate exam, thanks to the barriers of closed data networks. The cost is significant. To the patient, it can mean more time off work or away from preferred activities, unnecessary radiation exposure, increased lifetime radiation dose, and even anxiety about the reason for the second exam. To the clinician, it can mean longer time to outcome and the potential for reduced revenue in today’s value-based-care environment. No one wins. Using a diagnostic imaging repository (DIR), the potential for reducing unnecessary repeat imaging is great. As a centralized patient data source, a DIR can provide accessibility for an entire provider network across a wide geographic area. 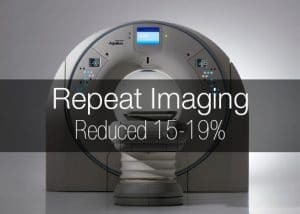 It can reduce unnecessary repeat imaging in two ways. First, it functions as a vendor-neutral archive (VNA) with the ability to pull data from different PACS, modalities and other sources, transform it, and make it available quickly. Second, it enables reconciliation of patient exams regardless of patient identifier, allowing clinicians to avoid ordering repeat exams. Avoid when possible. Protect when unavoidable. There are other costs to repeat imaging as well. Particularly for CT imaging, research has shown that the cumulative effect of repeat exams can increase a patient’s baseline cancer risk.‡ In this case, the advantages of having a DIR are twofold. If a patient has a viable recent CT, the study can be easily located, avoiding a duplicate exam. But in cases where many exams are necessary over a long course of treatment, the clinician can see the imaging volume over time for an individual and take extra precautions to protect the patient from excess radiation exposure. Better access can enable better outcomes. History may repeat itself, but diagnostic imaging shouldn’t – unless it’s absolutely necessary. To learn more about how you can provide access to prior imaging data across your enterprise, contact us today. * Hallet, Julie; Coburn, Natalie G., Alberga, Amanda; Fu, Longdi; Tharmalingam, Sukirtha; Milot, Laurent; Law, Calvin H.L. (2017). Reducing repeat imaging in hepatico-pacreatico-biliary cancer care through shared diagnostic imaging repository. Sunnybrook Odette Cancer Center. Canada Health Infoway. Institute for Clinical Evaluative Sciences. † Nagels, J.; Macdonald, D.; Coz, C. Measuring the Benefits of a Regional Imaging Environment. Journal of Digital Imaging (2017) 30: 609. ‡ Sodickson, Aaron; F Baeyens, Pieter; Andriole, Katherine; Prevedello, Luciano; Nawfel, Richard; Hanson, Richard; Khorasani, Ramin. (2009). Recurrent CT, Cumulative Radiation Exposure, and Associated Radiation-induced Cancer Risks from CT of Adults 1. Radiology. 251. 175-84. 10.1148/radiol.2511081296.